For about five years I lived on a quiet street in Berkeley called Capistrano Avenue. I was never comfortable with having to give, as my address, the name of one of the greatest Jew-haters in history, Giovanni da Capistrano. I call Capistrano a Jew-hater, not an antisemite. Antisemitism is a 19th-century term describing those who hate Jews as a race (or as a people, if one prefers to limit race to its modern American meaning, based on skin color). Giovanni da Capistrano (or John of Capistrano) was a 15th-century Franciscan friar and inquisitor who traveled around Europe preaching against all heresy, but especially Judaism. His hatred, then, was of Jews as a religious group, and he welcomed their conversion. But when that didn’t happen he encouraged states to expel Jews, and mobs to attack and kill them. He presided over several mass burnings of Jews. Why, then, would a famously liberal city like Berkeley name a street for such a personage? Otherwise, there seems to be a strong preference (presumably on the part of the developers) for naming streets for place names in California that are also Spanish names of Catholic saints: Santa Rosa, San Luis, San Miguel, San Juan, San Diego. But there also a couple streets bearing the Spanish names of famous medieval preaching friars — Vicente (Ferrer) and Domingo — without specifying their eventual sainthood. After incorporation into Berkeley, Vicente was renamed Vincente, perhaps to avoid confusion with Vicente Road, which is in Oakland but is served by the Berkeley post office. 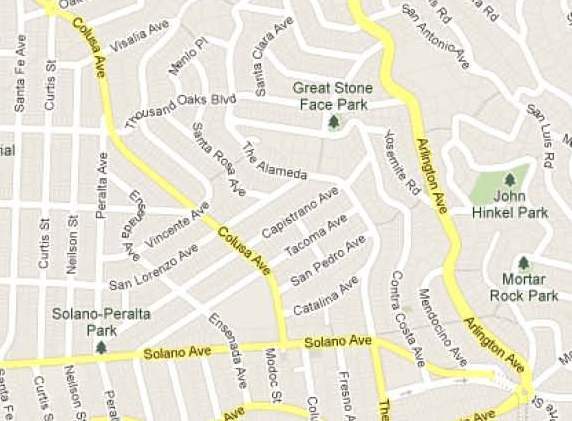 Other streets were also renamed because of conflict with existing street names elsewhere in Berkeley: as can be seen by comparing the maps, San Luis became Menlo Place, and San Diego became Santa Clara. Lastly, Escondido Avenue became Thousand Oaks Boulevard. Capistrano was, of course, sanctified, and the city of San Juan Capistrano in southern California was named for the mission founded there in his name. Whether the street is named for the city (which is often called simply Capistrano, as in the song When the swallows return to Capistrano) or directly for Giovanni is unclear, since both possibilities are present in the naming scheme. Either way, the name goes back to the Jew-hating preacher; I don’t think that the village of Capestrano where he was born, in southern Italy, has any importance on its own. And I find it strange that Berkeley not only did not change the name of street (as it did with others) when it annexed the area, but still has not done so. I now live in El Cerrito, about a mile north of the county line seen in the 1909 map, on a street named for a 19th-century naval commander who was also a Democratic senator. I am comfortable here. All right, class, what’s the plural of mouse? Of course, it’s mice when what is meant is an animal. Even animal names that look like compounds with mouse (though they are not so, etymologically), like dormouse or titmouse, take –mice in the plural. But when what is meant is an electronic device associated with a computer, the usual plural is mouses. When asked to pluralize the statement “a touch screen acts like a mouse,” most people will probably say “touch screens act like mouses,” not like mice. Now then, what is the plural of person? Of course, it’s persons. But for over 600 years people has also been used as the plural of person (as well as, at times, of man [when not limited to the male of the species] or of individual). There was a time, from about 100 till 30 years ago, when this usage was criticized by peevers, but I don’t think it is any longer. It is not so in legal language. The United States Constitution, for example, uses the people (the definite article is never absent) when it means the collective citizenry of the Union or of a State: “We, the People of the United States…”; “…chosen every second Year by the People of the several States”; “the right of the people…”; “…reserved to the States respectively, or to the people.” In none of these instances can persons be substituted for people. Otherwise, persons is invariably used: “…the whole Number of free Persons”; “…the Names of the Persons voting…”; “…The Migration or Importation of such Persons as any of the States now existing shall think proper to admit…”; “…vote by Ballot for two persons”; “All persons born or naturalized in the United States…”; and others. Note that all these citations refer to natural persons, that is, human beings. But there is another reason why the law eschews people as simply the plural of person: it also recognizes a legal person (also artificial person, juridical person, juristic person, and body corporate, also commonly called a vehicle), an entity that (to further quote Wikipedia) “has a legal name and has rights, protections, privileges, responsibilities, and liabilities under law, just as natural persons (humans) do.” But, to quote even further, “[g]enerally, legal persons do not have all of the same rights—such as the right to freedom of speech—that natural persons have, although the United States has become an exception in this regard.” But even in the United States legal persons (such as corporations, which are legal persons by definition) lack the right to vote, marry, or adopt children. To conclude: corporations may be persons, but they are not people. I am a devoted follower of Language Log, a blog (published right here on WordPress) in which a number of first-rate academic linguists post articles on all kinds of language-related matters, not limited to academic linguistics. I have always been fascinated by language and very interested in linguistics, to the extent that I consider myself an amateur linguist (in the same way that people can be amateur astronomers or botanists, though probably not physicists). Most of the Language Log contributors are hospitable to, and respectful of, comments from the lay readership, and I have not been shy about posting comments of my own. The number of categories covered by Language Log’s posters is vast (to see the list, click + at Categories on the home page). One of them is Peeving: the tendency on the part of many people to disparage aspects of language as used by other people, including such reactions as word aversion or word rage, baseless prescriptivism, and so on. One of the leading Language Log contributors, Arnold Zwicky, provided (in his own blog) a listing of peeving-related postings up to about a year ago, and more recent ones can be found in the peeving archive of Language Log itself. But sometimes the linguists at LL can get pretty peevish themselves. What rouses their ire (as opposed to mere amusement) may be journalistic clichés known as snowclones (“Eskimos have X words for snow,” “Language X has no word for Y,” “The Chinese word for crisis is…”), bad media descriptions of scientific results (especially by the BBC), and, most notably, misuse of linguistic terminology. Here, nothing gets our linguists (especially Geoffrey K. Pullum) as indignant as the use of passive voice (or, worse yet, passive tense) in a sense other than the standard grammatical one (here is a typical post by Geoff on this subject). But there is a good reason for this confusion. English has no special way of expressing impersonal action. It lacks an impersonal subject pronoun like the German man or the French on (man spricht Deutsch, on parle français), or the subjectless reflexive in Spanish or ltalian (se habla español, si parla italiano). The default English equivalent is English (is) spoken. (The omission of the copula is is typical of signs and headlines in English, but not speech, except for mock-primitive talk, as in me Tarzan, you Jane.) In my experience as a translator I have often found that the (true) passive is the most natural way of rendering an impersonal construction of this type. It seems quite natural for the term passive to have been generalized in everyday speech beyond its specific grammatical meaning. I don’t hear physicists complaining about lay people using quantum leap to mean ‘a large change’ or lightyears meaning ‘a long time.’ Physicists have, after all, appropriated the largely synonymous force, power, strength and energy, and given them very specific (and distinct) meanings in mechanics. Linguists are no different in this regard. Grammar once meant the study of a literary language, such as Homeric Greek in the Hellenistic world or Latin in medieval Europe (grammar schools were originally institutions where English boys were taught Latin). And a linguist was originally (and still is in popular and military usage) someone who knows several languages, a definition that would probably exclude Noam Chomsky. You are currently browsing the Coby Lubliner's Blog blog archives for February, 2012.